How do I choose a Fiji honeymoon resort? Discover how here. Find out about the most important decision you need to make for your once-in-a-lifetime romantic getaway. As my wikiHow article "How to find a Honeymoon Venue in Fiji" outlines, the most important decision for your Fiji honeymoon, starts with the choosing of accommodation. In my opinion, this is the biggest factor on how well your once-in-a-lifetime romantic adventure will turn out. Fiji is a mid-range priced destination. Most of it's accommodation falls into this range. If you want to find a really cheap tropical honeymoon, you are likely to strike up better deals in places like Bali and the Caribbeans, depending on where you live. If you are fine with budgeting from mid-range upwards for your honeymoon, then you going to be delighted. Fiji is world class. 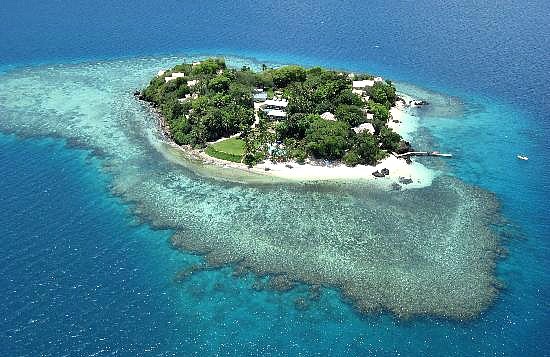 Most Fiji accommodation worth it's kava, offers a honeymoon package of sorts. This could range from just a bottle of champagne throw in, to a stunning package with all the trimmings including a remote picnic on a deserted island. The package could happen to be at a busy family resort with little kids constantly gnawing at your ankles. Or it could be at a location where there isn't any white sand, with the resort built on mangroves even though the website suggests otherwise (there's a few of these on the mainland). So, your best bet is to focus on the resorts rather than packages. You could probably be fine, but why take the risk with the sheer definition of your once-in-a-lifetime trip? You might end up paying a bit more, but as least you know you have given yourselves the best chance. We have established Fiji's status as a mid-range to top-end destination. Visit our Fiji Information Budgeting section for money estimates. If you have a top-end budget, then Fiji has some truly spectacular options. Weather in Fiji is classed as tropical with minimal extremes. This means there are minimal variations the whole year, and you could plan for your trip whenever suits your schedule. In saying that, May to October is the pick for temperatures and is also not cyclone season. Crowds won't affect honeymoon resorts as they have a low maximum number of guests and don't allow day trippers. Focus your search on resorts rather than packages, as stated above. Resorts that cater specifically for romancing couples is what you are after. These resorts are usually more intimate (smaller in size), in secluded locations (sometimes on it's own island), and the resort is geared towards privacy for the couple, while being adults-only or even couples-only. If you've followed step 3, you will find most, if not all, of the resorts are adults-only. This is what you are after. The outer islands offer more seclusion, better white sanded beaches, and better snorkelling and diving. Viti Levu's beaches (main island) run a distant second. Another aspect is the location of the bure (hut). Some offer absolute beachfront, another might offer hillside with spectacular views. Wanting a place to start looking for your perfect Fiji honeymoon resort? I thought so! Visit our Top Fiji Honeymoon Resorts section. We've done some of the leg work for you. If you have a budget then these Romantic Fiji Holiday E-guides does all the research for you!